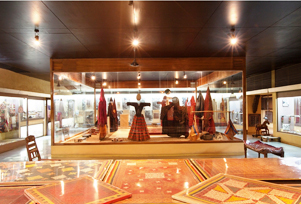 Shreyas Folk Museum was formed to salute the spirit of the women who have done a lot for the amelioration of Gujarat handicrafts with their unbound imagination. Privately owned by Shreyas Foundation, the museum was established on the tenets of Tagorian and Gandhian philosophies. Collection in the museum includes items that exude a vintage charm like weapons, coins, musical fountains, animal caparison, masks, and toys. Also on display are the folk arts from various communities of Gujarat such as Charan, Kanbi, Koli, Bhansali, Vania, Meman, Miana, Vania, Brahmin, amongst several others. Within the museum, there are four different sections- Lokayatan Folk Museum, Kalpana Mangaldas Balayatan Museum, Kathani and Shreyas Sangeet Vadyakhand. Established in the year 1977, Lokayatan Folk Museum includes items like colourful embroidery, beadwork, woodcarving, metal work and leather work, which were made by different communities. Lokayatan Folk Museum section particularly teaches the visitors about the rich cultural and traditional legacy of Gujarat. In Kalpana Mangaldas Balayatan Museum, one can see craft items from the fifty-four states and cities of India and countries. The highlight of the section is the elephant skeleton that is 3.19 m high. Also, there is an art gallery in the museum called Kashani. The art gallery showcases the festival fever of Gujarat through its pictures and photographs that were captured during the celebration. The last section of the museum is the Shreyas Sangeeta Vadyakhand. This particular section of the gallery exhibits instruments, bow, percussion and the wind musical instruments. From textiles to folk art to decorative collectible, here one can find some of the best art forms that bring out the traditional and rustic flavours of Gujarat. People, who want to be a part of some recreational activities, can attend workshops or go for a science centre in the museum. Attractions: 3.19 metre tall elephant skeleton, wood carving, metal work, bead work and utensils, leather work, costumes, paintings and animal decoration.